Facebook has become a game changer on the social media marketing front. I’ve gone from dipping my toes into Facebook marketing to becoming quite obsessed with it. I really want to know more about mastering Facebook, if that’s even possible. They change their algorithms all the time, the punks, which constantly, annoyingly, changes the ballgame. The fact is, you can’t get away from Facebook if you’re in the small business game these days. Even it’s just about having a social media presence and nothing more, Facebook is simply essential. You may have heard by now that Facebook only shows a fraction of your page’s posts to users even if they’re already fans. Newer fans will see more of your content than older fans. But if one post has good engagement, Facebook rewards your page by putting your next post in front of more fans, and seeing if you replicate your success. No pressure, eh? The more your posts invoke an emotive response, the higher the likely level of engagement. Here’s an example of a provocative post that I wrote a few months ago which had a total reach of 492 people, just under half of my followers. Now while 50% reach sounds a bit frustrating to me (and you, perhaps), this is actually a pretty high number for Facebook. In fact, if more than 11% of your fans see your content, you’re above average. It’s interesting also to note that of the 492 fans who actually saw this post, only about 20 of them actually engaged with this (expressed an emotion, commented or shared). Why, I wonder? There’s a whole other psychology issue at work here of what makes someone click ‘like’ but delving into all that isn’t on today’s agenda, I’m afraid. Today’s post is about some solid tips on how to boost engagement on your Facebook business page. That old chestnut. It’s so important. If you know who you’re targeting, you’ll naturally post content that they want to see. Which means a much greater likelihood of engagement. Check out your page Insights tab for info on demographics and see if that matches with your ideal client. Facebook is a great place to position yourself as an expert in your field so you want to get known for whatever you do. Not a jack of all trades. Niche down on your audience and they will appreciate it. So keep your posts short, sweet, and attention grabbing. 1-2 lines of text max, and short videos are always popular. We’re all visual monkeys after all. In fact, a text post with no image, link or video is going to rate very poorly, so make your posts pretty. Contrary little monkeys, aren’t they? Posts with a mix of media (images, text and video) have been shown to get more engagement than pages that just post the same type of content all the time. Facebook announced this in early 2017; reactions carry more weight than simple likes. It seems that it’s all too easy for followers to just click the ‘like’ button (I do this a lot!). The reaction buttons (love, wow, haha, sad, angry), which take a fraction more effort, are worth a lot more in terms of post engagement. This means that your posts need to trigger emotions. Ask questions for example, rather than state facts. Whenever you can, tag other people, companies, events etc (preferably with Facebook accounts) in your posts. The tagged user/s are notified and there’s a good likelihood that they will like, reshare and/or comment on your post, thereby exposing it to some of their followers too. 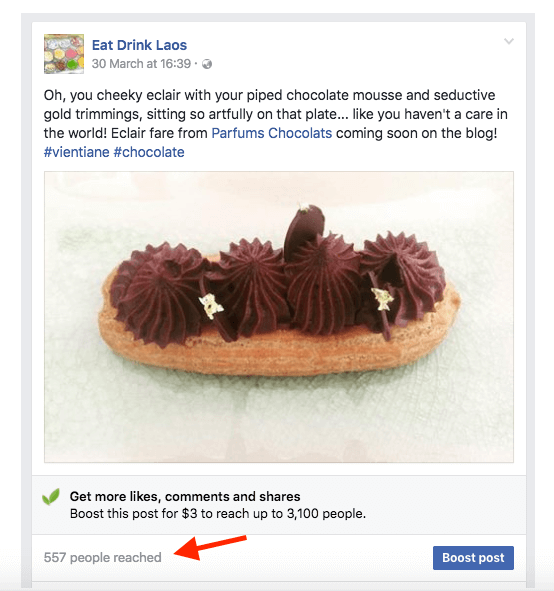 On my Eat Drink Laos Facebook page, my reach is routinely 500+ because I have a small target market (Vientiane, Laos), I always tag the restaurant or cafe, and everyone loves food photos. It is way easier to boost my reach and get engagement here than on my business service page (sob sob). This ties in with some of the basics of copywriting - a catchy headline is always a big pull. One popular title formula is number + positive + promise. For eg “15 awesome ideas to make kale smoothies tasty”. Ah, this is tapping at the pearly gates. It would be wonderful if others shared your posts with their audiences without you needing to do anything else. But why would they do this? Because your content makes them look good. Which means your content has to be really good! Granted, this isn’t easy. Tagging others is a good way, so are using breaking news, funnies, amazing photos, short instructional videos, recipes, memes, and anything else that stands out and is of value to your audience. Sometimes fans need a little nudge to respond to a post. You can invite people to share your comment in a few ways, from a simple “If you like this post, please share it” to a more calculated invitation to share a similar story or experience. Enjoying this post? 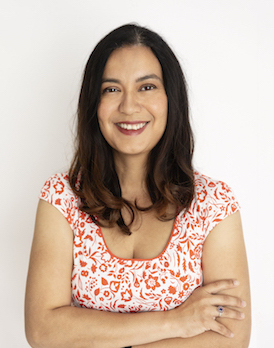 Then join my weekly newsletter for loads more DIY marketing strategies! I’ve noticed that people love getting onboard with this stuff. One of my friends did a 30 day video ballet challenge where she filmed herself doing a pirouette every day. It was so simple and yet it worked really well. There’s loads of challenges - fitness, writing, green smoothie recipes, you name it. You’ll need to show your own commitment to the cause, preferably with photos or videos and it may be a bit slow at first but it’s worth a shot. It’s the medium of 2017 and you can try it out with Facebook Live. It’s raw and human and everyone seem to love it. It’s a good idea to go for short clips that can be understood with and without sound. Captions are a great way to do this. You can also download your videos and use them elsewhere. We all have businesses whose success we aspire towards and it’s great to check out how they’re doing on Facebook. Get some engagement inspiration from their top posts. Go to Insights and scroll to the bottom of the Overview page. You can add up to 5 other Facebook pages to keep tabs on. There! I hope this helps you to boost your page engagement and audience reach. I didn’t of course mention paid Facebook Ads which is a whole other deal full of more tactics and strategies. And that's something you should definitely look into. But organic (unpaid) reach is super important so trial some or all of these ideas on your page and you should notice a big difference! Tell me, what’s worked - or hasn’t worked - for your Facebook page?